Garmin’s StreetPilot GPS offerings for the iPhone just got a bit more social. Facebook and Foursquare users can now check in at a location from within Garmin StreetPilot. Both Garmin StreetPilot and Garmin StreetPilot onDemand saw updates last week in conjunction with the Macworld | iWorld show. 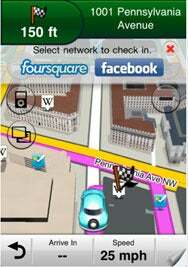 Version 7.5.0 of the GPS navigation apps added integration with Wikipedia, Facebook, and Foursquare. Maps in the mobile navigation apps now include Wikipedia icons that contain more information about a particular location or point of interest—ideal for helping you identify a building or landmark when you’re in a new town. With Facebook and Foursquare integration, users can now check into locations directly from the StreetPilot app. The 7.5.0 updates also add new voice and vehicle icon options for personalizing the apps. Garmin enhanced the 3D renderings of buildings in the new StreetPilot versions. The TripPlanner feature now lets you create, edit, and save multiple routes before you start your journey, while Via Points makes it possible to add multiple stops on your route.